Replace those old worn out halyards now with these low stretch new ones. 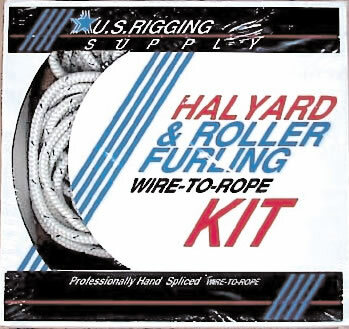 Featuring professional wire to rope splices for smooth travel over the mast head sheave. The wire is 7x19 stainless for flexibility, durability and low stretch and it is left unfinished with a thimble and nico included so you can cut it to fit your rig. All halyards have braided white line tails with tracer flecks. Wire rope halyards include one thimble and nico swage fitting. These halyards are made from low stretch Sta-Set polyester line and come pre-spliced with a shackle. White Line with dark tracer flecks.